The weather this weekend will be really hot, with tropical temperatures going over 30° C (86° F). So make sure you drink enough water. For more details check the weather forecast below. FOOD FESTIVAL This Saturday, the third year of the biggest “street food” show in the Czech Republic is taking place on the “Smíchovská náplavka” embankment. Between 10 a.m. and 8 p.m. you can enjoy various kinds of snacks prepared and served in original food trucks. The food festival introduces the current “streetfood” theme, and gives you a chance to taste some rare dishes. This year, cooks from Malaysia, Thailand, India, Indonesia, Lebanon, Georgia, Mexico, Peru, Argentina, USA, Egypt, Morocco, Portugal, and France are going to be present. The entrance fee is a token 50,- CZK and includes a gift. Children have entrance free of charge. Find more information on the Facebook Event page (unfortunately available in Czech language only). LIGHT SHOW On Saturday and Sunday you can visit a unique Light Art Show, taking place in the “Divadlo Perštýn” theatre (Na Perštýně 6, Prague 1). The performance starts at 8 p.m. and during 30 minutes introduces the story of the historical Prague, using the art of live painting with light. On the screen, you will see the most beautiful sights of Prague, romantically accompanied with emotive music and sound effects. The entrance fee varies from 150,- to 500,- CZK. Visit the show´s Facebook Event page for more information. RUNNING For active people and lovers of original ways of sightseeing, there is a special sporting event taking place in Prague this Saturday. Prague 7 is, thanks to the “Letná” and “Stromovka” parks, a very popular place for all runners. And at the same time, this Prague district is an area which puts a lot of emphasis on culture. 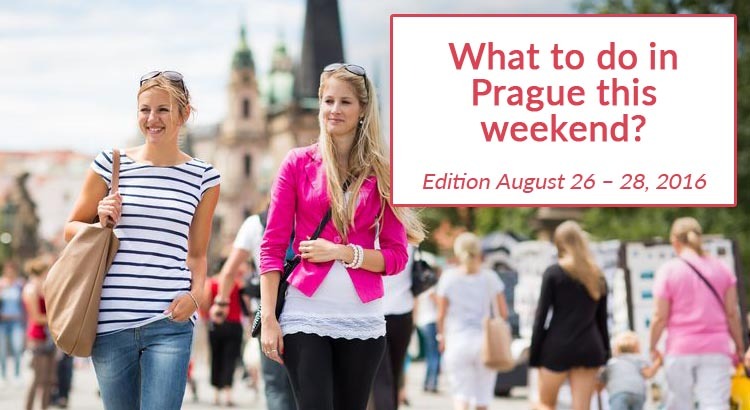 On the last Saturday of August, the both features of Prague 7 are going to be connected originally. At 2 p.m., the run starts in the “Letná” park (Running Mall) and the 3 hours taking track will lead all participants through Prague 7 and around statues, historical collections, and a museum to the DOX centre. Book today on the e-mail address rezervace@dox.cz. You can run free of charge. Find more info on the DOX Centre for Contemporary Art website. EVENING ZOO On Saturday, you can enjoy a very special tour in the renowned Prague Zoo (“U Trojského zámku” street 3/120, Prague 7 – Troja). It allows you to experience all the Zoo’s wonders at twilight. The night walk with a professional guide starts at 9 p.m. and takes an hour and a half. Among other things, you can see sleeping elephants or, on the contrary, active hyenas. The evening tours cost 250,- CZK for adults and 160,- CZK for children. Entrance fee, guide services and parking are included. Due to a limited capacity, you need to book the tour in advance. If you are interested, contact the Zoo’s representatives (+ 420 296 112 230, pr@zoopraha.cz). You can find more info on the Prague Zoo’s web pages. EVENING TOUR As part of a big event organized by The National Heritage Institute and taking place all around the Czech Republic, there is a special tour at the “Chvalský zámek” castle (Na Chvalské tvrzi 857, Prague 9) going on this Saturday. Between 6 p.m. and 10 p.m. you can take your children on a night-time commented tour with fairy-tale characters. You will see the castle in the light of candles, a secret chamber, and an exhibition called “Mercury is not just a planet”. You can book the tour on the following telephone number: +420 281 860 130. The entrance fee is 120,- CZK for an adult, while the family entrance fee is 290,- CZK. Find more information on the Facebook Event page (unfortunately available in Czech only). MUSIC CONCERT The oldest Czech big band will perform in the Reduta Jazz Club (Národní 20, Prague 1) on Sunday, 9:30 p.m. – 23:59 p.m. The Prague Big Band, founded by the famous Czech conductor Milan Svoboda, will please all orchestral jazz lovers with an exclusive appearance featuring one of the best Czech jazz soloists. The entrance fee is 350,- CZK. You can find more info and make your booking on the Reduta Jazz Club’s website. EXHIBITION Before it leaves for its tour around Asia, you can see the famous Slav Epic in the Prague Trade Fair Palace (“Veletržní palác” in Czech). The series of twenty monumental canvases by the renowned Czech Art Nouveau painter Alfons Mucha depict the mythology and history of the Czechs and other Slavic peoples between 1910 and 1928. The exposition is available on both Saturday and Sunday, 10 a.m. – 6 p.m. The entrance fee is 180,- CZK. Find more info on the National Gallery in Prague website. EXHIBITION In the Imperial Stables ofPrague Castle, you can see an exhibition focused on the long history of the coronation of Czech kings. Admire a precious set of coronation symbols, such as reliquary crosses or the Golden Veraikon, and feel the breath of history while looking at the oldest existing manuscript of Charles IV himself or the crown of Czech queens from the 14th century. The full entrance fee is 190,- CZK. See more info on the Prague Caste web pages. EXHIBITION Also within the frame of the 700th birth anniversary of Charles IV, there is yet another ongoing exhibition taking place in the National Technical Museum of Prague (“Kostelní” street 42, Prague 7 – Holešovice). The exhibition, as its names suggests, focuses on the art of architecture during the reign of Charles IV, which was a great building “boom”. The exposition has been built up as a construction site, displaying contemporary building professions and technology. The full entrance fee is 190,- CZK. During weekends, the museum is open 10 a.m. – 6 p.m. See more info on the Museum web pages.